The Frontier is known as a hub for startups and small businesses in The Triangle. We like to say that we welcome companies of all shapes, sizes, and sectors. From individuals in the early stages of ideating a business, to a five-person operation who just gained funding for a permanent home, there is a seat for everyone at the table within our community. 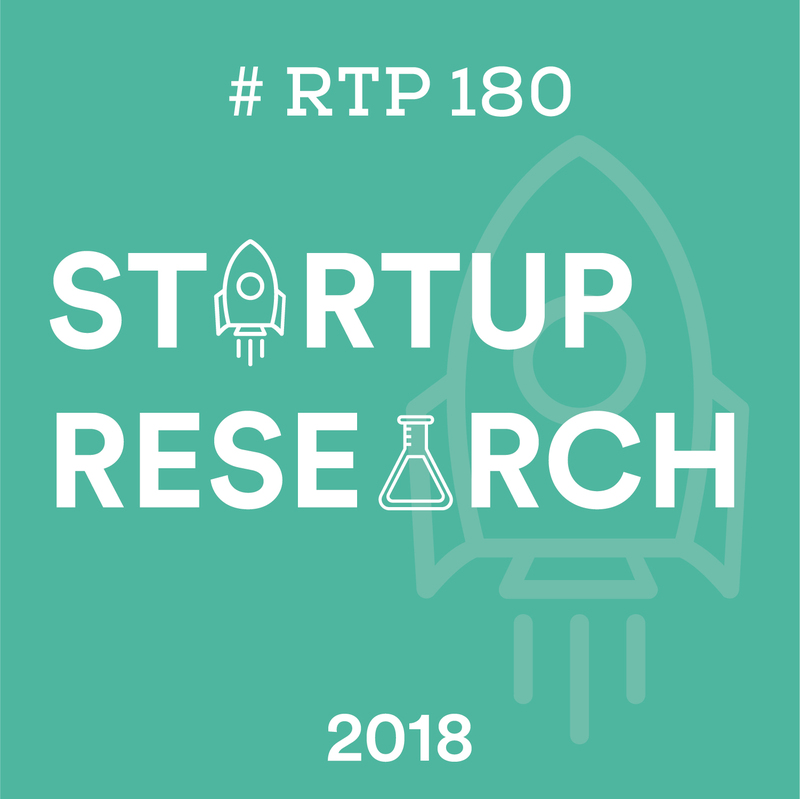 That’s why this month, we focused RTP180 on Triangle companies who are doing unprecedented, bootstrapped research with a startup mentality. Dr. Daniel Stanhope | Lea(R)n, Inc.
Daniel is Vice President of Research and Analytics at Lea(R)n, Inc., a company that was founded to generate insight into the success and impact of classroom technologies. Their product, LearnPlatform, provides a research-based method of evaluating and managing EdTech tools. The goal of this research, Daniel says, is to help schools and educators determine which technology will work best for them by analyzing what’s working (and what isn’t) for other schools and teachers. This helps them find the most impactful tools for their classrooms, and make the most of their resources. Watch Daniel’s talk here. Anjani Jha, President and CEO of MAA Laboratories, explained that his company is working to make good drugs better. They do this by taking small molecules and developing a new formations to create improved products using a patented technology. Anjani says that many drugs that com to market have low solubility or efficacy. The MAA Laboratories team is focused on mitigating these liabilities by reformulating these products to eliminate those issues. Benefits include increased therapeutic efficiency, enhanced targeted drug delivery, and elimination of food-related side effects. Watch Anjani’s talk here. Caley Patten, a Management Analyst at the City of Durham, joined us to talk about Innovate Durham. This program is designed to help startups and entrepreneurs and tackle issues that impact the community at the same time. They do this by offering a 12-week partnership program (applications for 2018 close on June 15) that enables innovative local businesses to test their product or service in a collaborative, supportive environment. Program participants also receive access to Durham County data, resources, personnel, and infrastructure, helping them navigate growing pains while partnering to improve the social, environmental, and economic quality of Durham. Watch Caley’s talk here. Dr. Natalia Mitin is President and Co-founder of Healthspan Diagnostics. She explained that although the affects of aging can differ greatly from one individual to the next, and treatments for related health issues were largely the same. She and her company are working to create personalized treatments based on molecular age signatures. Your molecular age includes specific health factors, like genetics, exercise, and smoking, and can provide other biomarkers that help determine your risk of disease, how you will react to treatments, and more. She says customized treatments will lead to better health outcomes and quality of life for patients. Watch Natalia’s talk here. Dr. John Sheppard closed out the evening by sharing his research on beer. Trained in biochemical processes, John works at the NCSU Department of Food, Bioprocessing and Nutrition Services. His interest in and study of food and beverage fermentations led him to found Lachancea, a micro-brewery specializing in sour beers brewed with wild yeast. John pointed out 95% of beers are made with just one of two types of yeast, because wild yeasts were thought to contain bacteria. Lachancea researchers discovered a unique yeast that had never before been used in brewing, enabling them to brew one-of-a-kind flavors quickly and without risk. Watch John’s talk here. Ready for the more RTP180? June 21, we’ll be discussing weather and climate with local experts from Duke University, WRAL, NIEHS, EPA and RTI International. Get your tickets. Special thanks to UNC-TV for live streaming this event. RTP180 is presented by RTI International.